Perfect for both indoor and outdoor settings, these Hi-Lo adjustable drinking fountains cater to twice as many users as most standard drinking fountains. Front access to valve adjustment and cartridge replacement offer easy maintenance, and the anti-microbial protection keeps the fountains sanitary. The beautiful satin finish resists stains and corrosion, while the soft rounded corners prevent mishaps and other accidents from occurring. The one-piece stamped bowls give the fountains a low-profile basin that is attractive and inviting in all settings. Unit can be mounted to meet ADA or Child ADA specifications. Model 1117L Series meets current Federal Regulations for the disabled including those in the Americans with Disabilities Act. Haws manufactures drinking fountains, electric water coolers and electric drinking fountains to be lead-free by all known definitions including ANSI/NSF Standard 61, Section 9, California Proposition 65 and the Federal Safe Drinking Water Act. Capabilities combined with its ease of use allows for a number of installation location possibilities. Supplied with a low profile bowl, individual adjustment panels, and multiple mounting positions for adult and child ADA considerations. Patented (Pat.# 6,981,692) stainless steel, push-button activated, valve assembly which allows for front access stream adjustment as well as cartridge and strainer access, this fountain offers 100% lead free waterways. The valve works at an operating pressure range of 30 to 90 psi. Polished chrome-plated brass bubbler head features an integral basin shank for added strength, and is equipped with a shielded, anti-squirt orifice. Both fountains are pre-built and fully water and pressure tested to ensure no leaks and proper function for reduced installation time and added peace of mind. 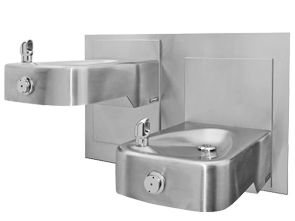 Barrier-Free (Universal Access), Stainless Steel Drinking Fountains. 14 gauge Type 304 Stainless Steel Construction. Hi-Lo Adjustable Design Allows for Twice the Users as Regular Fountains. Push-Button Operated Stainless Steel Valve with Front-Accessible Cartridge and Flow Adjustment. Polished Chrome-Plated Solid Brass Bubbler Head with Stainless Steel Water Activated Pop-up Canopy. Polished Chrome-Plated Vandal-Resistant Combination Waste Strainer.